On the surface, it starts off like a lot of other horror flicks: After driving a long way out of the city, a young couple, Rose (Allison Williams) and Chris (Daniel Kaluuya) ends up at a house in the woods in the middle of nowhere. The nearest neighbors are miles away, across a lake. Things seem normal and welcoming enough at first, but soon begin to feel creepy—then very creepy, and then extremely creepy. 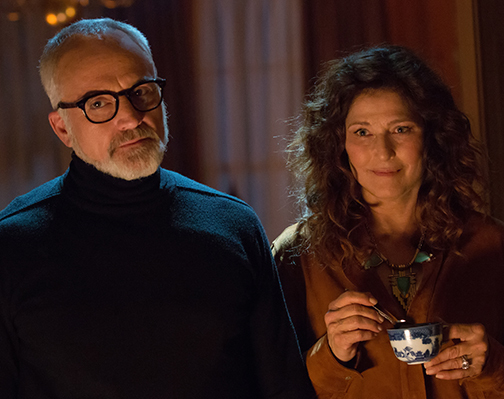 Oh—she’s white, he’s black, and five months into their relationship, they’ve gone for him to meet her parents (Bradley Whitford and Catherine Keener) for the first time. Now, in this modern age, interracial dating isn’t even a thing anymore, right? Certainly not among upscale, enlightened, encultured white liberal lefties, folks who “would have voted for Obama a third time” if they could, who love golfer Tiger Woods and who “admire” the culture and the achievements of the black race, all the way back to Jesse Owens besting the Aryan Nazis at the 1936 Berlin Olympics… Right? If Get Out doesn’t exactly sound like any horror movie you’ve ever seen before, that’s because it is, and it isn’t. It takes familiar horror conventions and runs them through a filter of caustic satire about what it’s like—and what it feels like—to be a black man in an America dominated by white culture. And it comes out as one of the most original horror movies in years. What’s it like to be a black man with a white woman on a lonely stretch of two-lane when a cop demands to see your ID? What’s it like to be walking alone on street at night in an all-white neighborhood when an automobile rolls up ominously…then stops alongside you? When white people make fawning comments about you and your “people” as if you were different, genetically, physically, culturally? What’s it like, in a movie like this, when all those things are amplified through a creepshow channel that keeps turning up the volume, slowly but surely, until everything finally explodes? The director and writer is Jordan Peele, of the Emmy-winning Comedy Central duo Key & Peele, and he makes a very impressive debut behind the camera, indeed, mixing real chills with generous dollops of genuine laughter—many of them thanks to comedian Lil Rel Howery, who plays Chris’ best friend, a TSA agent who was wary all along of “his boy” venturing upstate to the all-white enclave of Rose’s world. Peele (who is himself married to a white woman, comedian-actress Chelsea Peretti from TV’s Brooklyn Nine-Nine) is playing with dynamite, and he knows it—especially in a nation, at a time, of #blacklivesmatter, when tensions in communities across the country continue to roil and rumble. 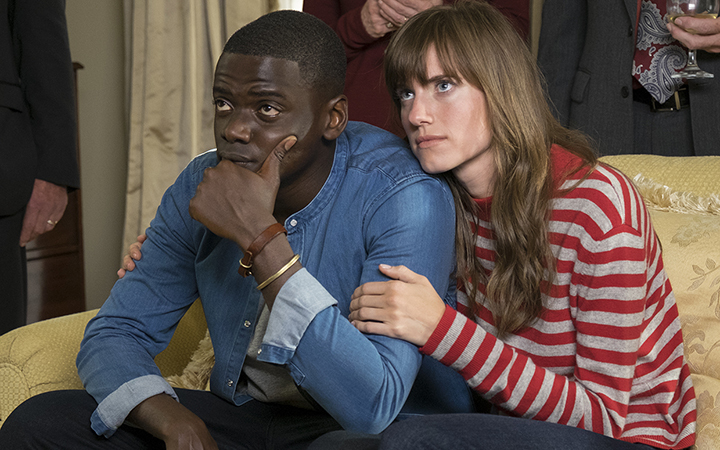 You can certainly enjoy Get Out for the pure, giddy goosebumps it brings, but you’d be missing the film’s masterful layering of timely social commentary as well as Jordan’s bold, eventually bloody, cathartic critique of black-and-white relations and stereotypes. And Peele doesn’t stop there. He draws a subtle, scathing line that connects American imperialism all the way back to its colonial roots, when white men essentially took whatever—and whomever—they wanted. I don’t want to give too much away, but imagine Meet The Parents plus Guess Who’s Coming to Dinner crossed with Invasion of the Body Snatchers and The Stepford Wives and given a twist of Twilight Zone and maybe even a shot of M. Night Shyamalan. All with a bracing, blistering message about race and skin color—one meant to get under everyone’s skin.